In West Cork we're surrounded by animals of all kinds. Here are some of my favourites! Black and white cows, lying in the fields with their backs to the rain, peacefully chewing the cud, are a familiar sight in the Irish countryside. Here they are made in white stoneware with a smooth matt finish. Each one is hand painted with a different pattern of spots and patches, just like the real ones. 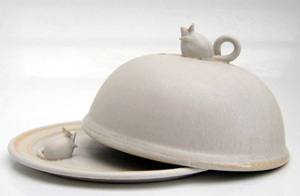 A big cheese plate and dome, glazed in a matt greyish-white glaze. A cheeky mouse has found his way inside, and another sniffs the aroma through the air vent on top. A small cheese plate and dome, glazed in a matt greyish-white glaze. A cheeky mouse sits on top, no mouse inside. Contact usabout availability of the items on this page.